I will describe here some anomalies that can be found in SE. These anomalies are not bugs, but were introduced into the SE code. This is a relatively rare object. A planet should be a terra or oceania (calid, temperate or cool), and its sun should be a normal star (main sequence or red giant) with its age at least 300 million years (so don't try to search for planets with life near blue supergiant stars - they usually have a lifetime of a few millions years). Even if all these criteria are satisfied, there is only a 30% chance for a planet to develop life (this is by the way a very optimistic probability). If a system has several planets or moons that can support life, then all of them will have life: I assume that panspermia works very well at least in a single planetary system (panspermia is a transport of primitive lifeforms from one planet to other by rock debris ejected into space by asteroid impacts or huge volcanic explosions). The current version of SE (0.95) has some bug in the system generation code, so you can find warm, cold or even frozen terras with life. 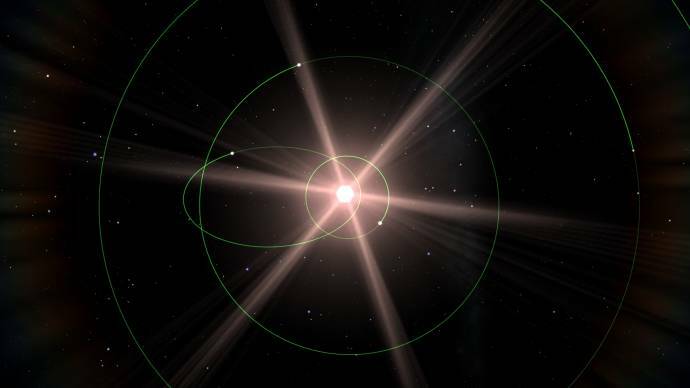 2) Planet on highly elliptical orbit. The planet has a 7% chance to have such an orbit. 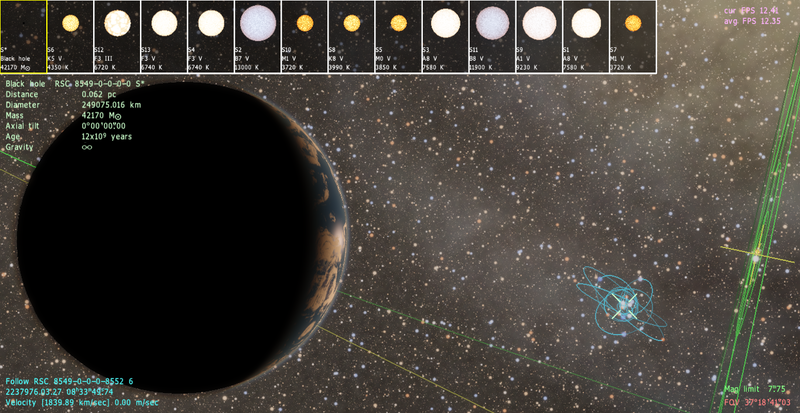 In reality, such orbits can be formed if planetary system was passed through an instability phase, then gas giants migrate closer to the sun and disturb orbits of inner planets and other gas giants. Our Solar system avoided this stage: Jupiter and Saturn are now placed nearly on the same orbits where they were born. 3) Moon with high inclination or retrograde orbit. 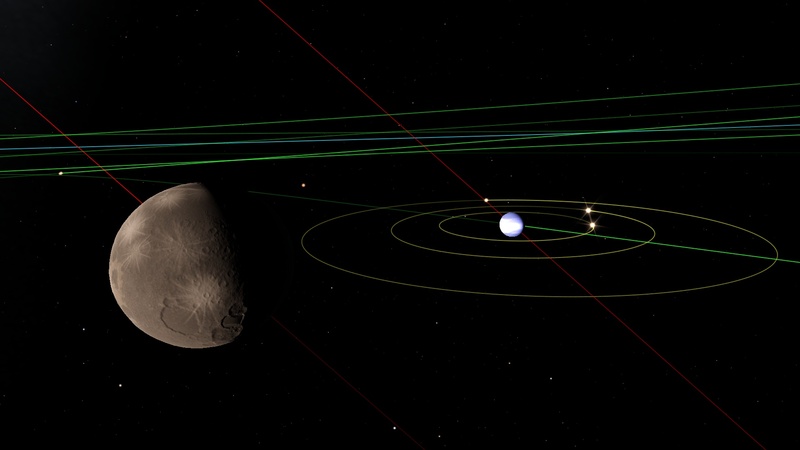 In reality, close regular moons are usually formed from circumplanetary disk of dust or debris, so they have circular orbits aligned to a planet's equator. But a moon's orbit can be disturbed by gravitational forces from other larger moon or by huge collision. In SE, close moons have 1% chance to have a high elliptical orbit. Distant moons usually are captured asteroids or other larger bodies (like Triton), and can have a random (irregular) orbit. In SE, they can always have high inclination and even a retrograde orbit, like small distant moons of Jupiter and Saturn. 4) Planet or moon with high axial tilt. There is a 20% chance for a planet to have obliquity of more than 40° and even more than 90° (retrograde rotation). In reality this is caused by a huge planetary collision when the system was formed, or some other unknown process. Example: Venus, Uranus. 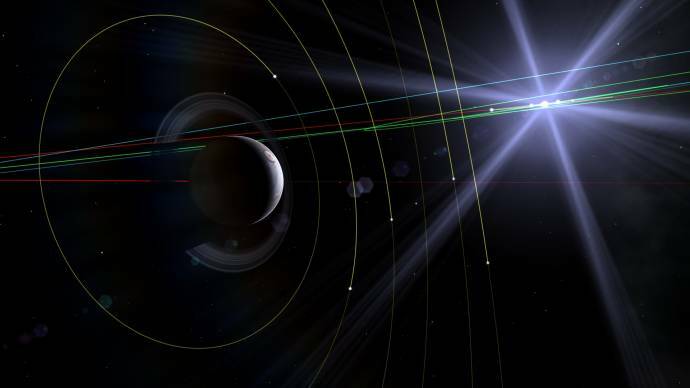 Moons can have high axial tilt, only if it rotates far away from parent planet or if the system is young, so tidal forces have no time to stop its rotation. A moon can have a day length not equal to the period of rotation around a parent planet, only if it rotates far away from a planet or if a system is young, so tidal forces have no time to stop its rotation. 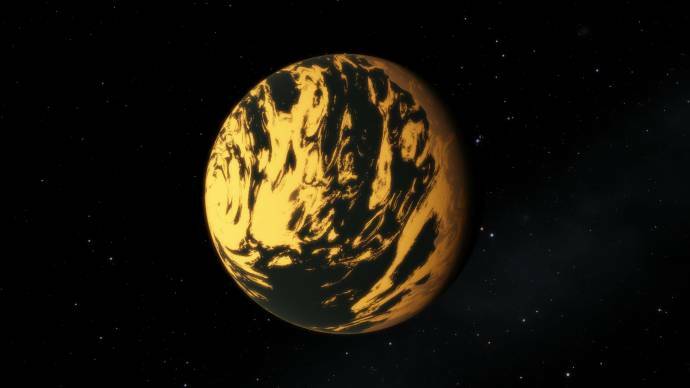 7) Tidal-locked planet (to its sun). 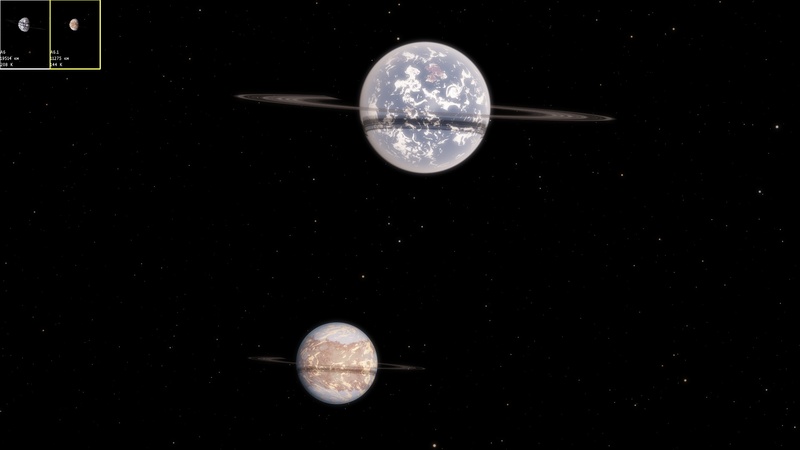 These planets can be found in red dwarf systems: the planet should have its orbit very close to a sun (it is possible only if sun is small and dim, like a red dwarf), and the system should be old enough to have tidal forces stop a planet's rotation. In this case, one hemisphere of a planet is always facing the sun, and another hemisphere is always in night-time. If a planet has a thin atmosphere and has no bright second sun that can heat the night hemisphere, then the night hemisphere can be covered by a thick glacier, or even have all water, almost all the atmosphere can freeze in the night hemisphere. Often, the atmosphere of such a planet has a strange wind pattern: it can form a giant cyclone in the daylight hemishpere. Current version of SE (0.95) can't render an atmosphere with any color, but only can use one of six predefined model (taking into account a sun's color). Maybe in the next version I'll implement some scientifically-based "recoloring" of the atmophere. 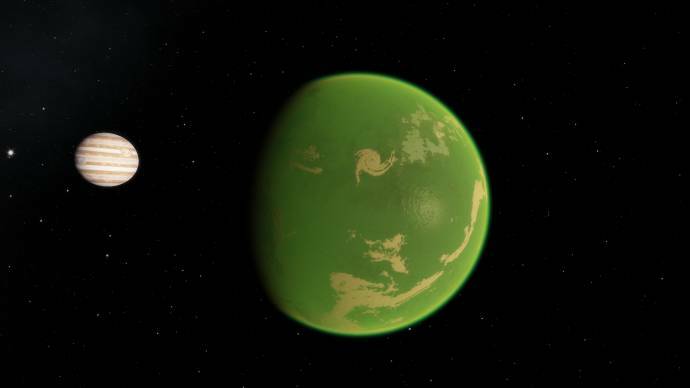 What is the acid green atmosphere representative of in science? Maybe you can implement oceans and lakes with other colours except blue. hydrocarbons lakes should probably be black. 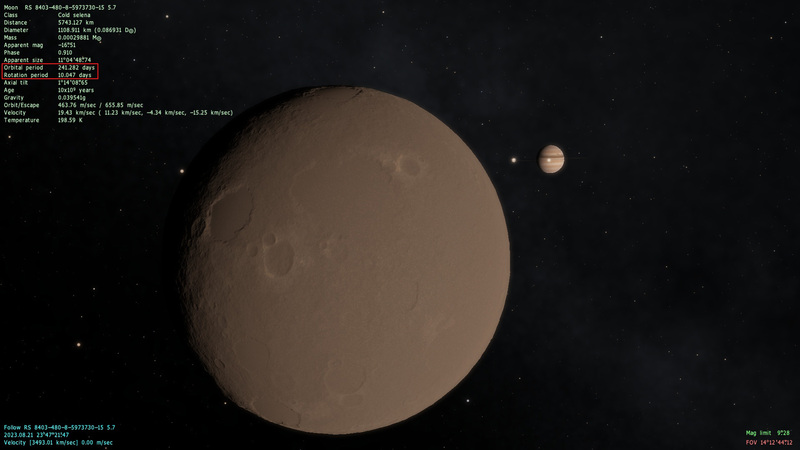 Is there any possibility of a gas giant planet with a gas giant moon? It could be realy, realy REALY rare. Also, are comets hard to implement on current engine? Other thing you could implement is rivers. It could appear on any planet with surface liquids. Very cool list, I hope you plan on adding many many more anomalies in the future. Yes, comets require a particle system. Rivers are very hard to implement - they are computational expensive (erosion). Fractal shapes will make only something river-like, and I can't find anywhere such fractals are based on perlin or voronoi noise. Note: I can't implement recursive algorithm like fractal line building, because GPU shaders don't support deep recursion. Terragen has perlin and voronoi erosion shaders for creating realistic river systems as can be seen from this image. 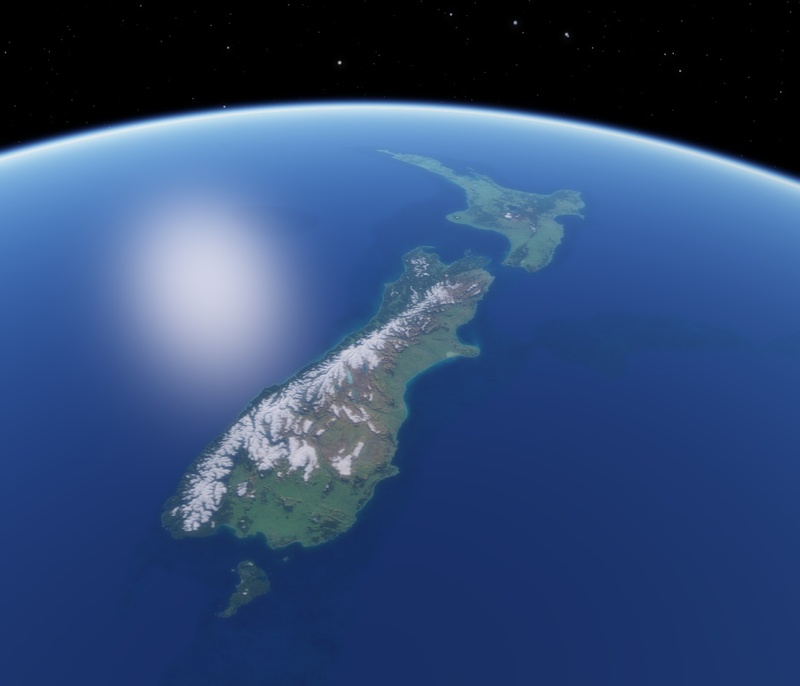 Also, Terragen is not real-time renderer. Yes I read the thread fully and see that he used map data to get the river beds. Also I have searched their forums and they also have trouble creating realistic river bed systems. I am sure I have seen something from DandelO that does it though. I think GeoControl does it as well. But I have never used it so cant be sure. Well, gas giants often end up migrating during the formation of a system, don't they? What if a small one (presumably an ice giant) happened to get quite close to a large one during this process, and their speeds happened to be matched up very well, couldn't the gas giant capture the ice giant as a moon? This would of course be incredibly rare, as the speeds would have to happen to match up very well and the ice giant's orbit would have to be quite wide to prevent them from tearing each other to pieced with their gravity, but we know it's not impossible for planets to catch each other, as we have one example of it in nature: Triton, which (if I remember correctly) is believed to have been a large Kuiper-belt object that was caught by Neptune. 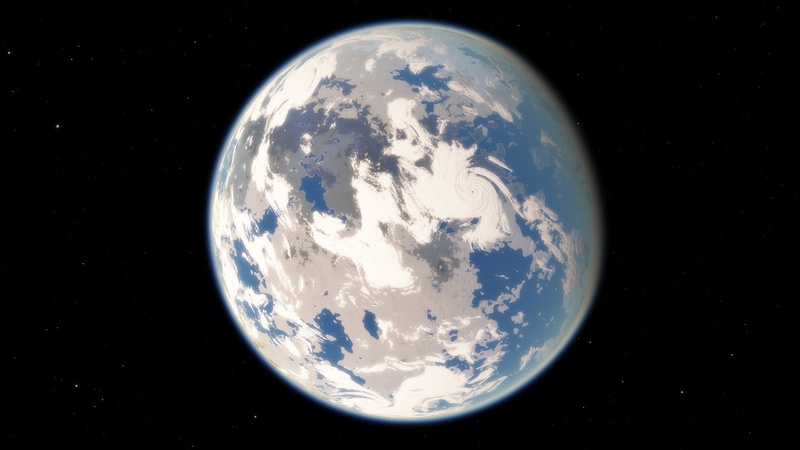 A gas giant capturing an ice giant would be incredibly rare, of course, but I don't think it would be impossible, and maybe there should be a tiny chance (really tiny) for a system to include such a pair in SpaceEngine. I've found a terra with life who orbit at 0.62 pc of a black hole and I was wondering if such a thing could exist in real. It seems to me that all those stars close by each other in globular clouds would completely mess up planetary orbits, and any planets would probably get bowled around like headlice in a primary school class. Before they had an inevitable collision with some star, the central black hole, or just got kicked out of the cluster, that is. This would probably be even more true so close to the central black hole. Aside from that, there's loads of supernovas ready to vapourise planets in globular clusters, bucketloads of radiation that would thoroughly mess up atmospheres and oceans (not to mention life), and probably other problems as well. So no, the existence of any planet in a globular cluster is unlikely, but one so lovely even more so. "mess up planetary orbits, bowled around, inevitable collision, kicked out of the cluster, supernovas ready to vapourise planets, bucketloads of radiation.. " well , that's a lot of problems to overcome, as I imagined. but one so lovely even more so. ^I've been seeing one or two too, but maybe it's just that gas giant moons are often really large in the new version, and thus conditions where ringed moons can happen more common? I've been seeing a lot of moons larger than Mars in the new version.